See Bellis perennis L. for details. Double-flowered garden form, synonymous with Bellis hortensis which has red or white flowers. ‘The daisy, a plant common to Europe, in its wild state delights in open situations, which are moderately moist, its root is perennial, and increases greatly; the usual colour of its flowers is white, the florets are sometimes tipt with red, but more frequently red on the under side. When double, the daisy becomes much more ornamental, and in this state many varieties of it have long been cultivated, very generally in gardens; those principally found in our nurseries are: The large double daisy with florets of a deep red colour on the under side, figured on the plate; the flowers of this sort will sometimes expand nearly to the size of a half-crown piece, and are the most shewy of any that we have seen; the foliage of this sort is also proportionately larger. The pale red double daisy, more delicate in appearance, but smaller, varying in its shades of colour. The pure white double daisy. 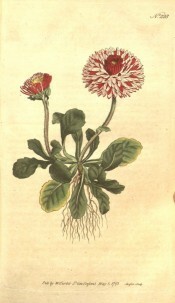 The deep red double daisy; in this the petals are usually tubular or quilled. Besides these, there are: The coxcomb double daisy, both red and white, in which the flowering stem rises up preternaturally flattened, and carries on its summit a long-extended ridge of flowers, frequently of an enormous size; this monstrous production seems to arise from the coalescence of two or more flowering stems and as it is of accidental origin, so we find that a daisy which has been a coxcomb one year, shall lose that appearance entirely the next.’ [BM t.228/1793]. Listed in the 1850 and 1857 catalogues [H.27/1850].